Kandalu Software brings you the best in cd and dvd burning capabilities for Mac users. Have you ever wondered how to convert your QuickTime files to NTSC or PAL? Watch them on PC? It's effortless with K Kitchen 3, a burning and ripping program which gives you the option to burn to necessary formats such as Divx and VCD. Drag and drop the files into K Kitchen and let it go. Configure your settings for the type of file you would like. ...... Push burn and let it go. K Kitchen 3 from Kandalu brings you powerful and easy burning capabilities for your Mac. Burn CD to Mac or DVD to Mac by simply dragging and dropping. Configure burn settings and use any sort of QuickTime file to create VCD, SVCD, DVD and Divx discs. Create files in NTSC and PAL, format discs for MAC and PC. 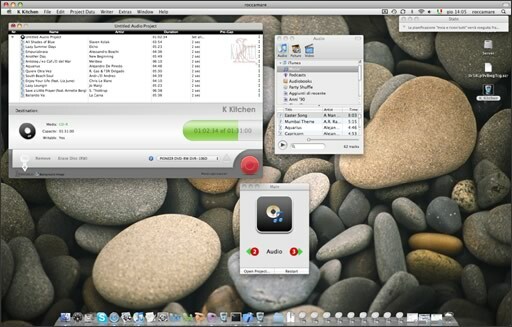 K Kitchen Video burns QuickTime files to these different formats: VCD, SVCD, DVD and Divx. Burn your videos for NTSC or PAL regions. K Kitchen Video is easy to use and creates fantastic results. Look no further for a dvd burner for Mac users. Kandalu Software Ltd is a key provider of consumer digital media creation applications and produces innovative, easy-to-use products and media services that empower people to create, manage and share their digital media. Qweas is providing links to K Kitchen 3.0.9 as a courtesy, and makes no representations regarding K Kitchen or any other applications or any information related thereto. Any questions, complaints or claims regarding this application K Kitchen 3.0.9 must be directed to the appropriate software vendor. You may click the publisher link of K Kitchen on the top of this page to get more details about the vendor.